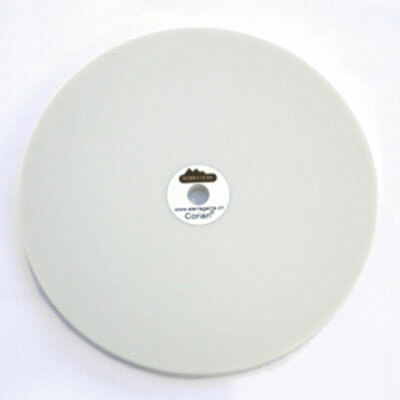 Corian Polishing Lap 6 at the Lowest Prices from Sierra Gems! 6" Corian Polishing Lap - 1/2" Arbor Hole. Corian is a solid surface and doesn't take a charge. Use diamond powders, diamond pastes or oxides as polishing agents. Does an excellent job on a very wide range of stones. Works well from Fluorite to Danburite. Produces a moderate amount of heat with pressure. Light touch works best to produce very nice flat facets. Facets are easily cheated in. This lap will polish topaz, chrysoberyl and sapphire, but there are other laps that are better suited to those materials. However there are professional sapphire cutters who use this lap for polishing. Washing thoroughly with dish detergent removes old charge and the lap may then be charged with different compound or grit .